Air fryers might be even hotter this holiday season than multi-use slow cookers like the ones from Instant Pot, and that’s saying a lot. It makes perfect sense though, considering that these awesome devices cook up crispy food that’s delicious, but without all the oil that you need when you deep-fry foods. 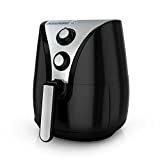 The BLACK+DECKER Purify 2-Liter Air Fryer is one of the most popular models on Amazon. In fact, it was even awarded a coveted “Amazon’s Choice” designation. This model retails for $150, but it’s on sale for Black Friday for less than $70 after a 10% coupon on the Amazon page. That’s an all-time low by a wide margin, and you should definitely take advantage.